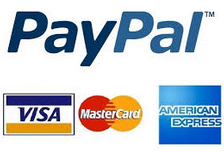 We accept all major credit cards through Amazon, PayPal, 2Checkout or ShareIt. Purchase orders are also welcome. Please call us toll free at (888) 881-CORE if you need assistance! Buy with confidence, knowing that if you are not completely satisfied with AlwaysUp you can request a full refund within 15 days of your purchase. After you pay for the software, we will send you an email to thank you and to start the online registration process. Click here for full details. No need to create a PayPal account — just enter your credit card details. Place your order in English, Deutsch, Français, Español, Português, Italiano.